No Frills Band, The | The Goose Is Out! 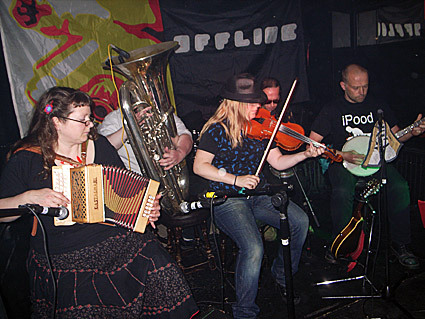 We were delighted to welcome The No Frills Band to The Aquarius Festival in the summer of 2011, featuring brilliant hurdy-gurdy player Jessica Cahill who had played at the festival in 2010. We were equally delighted when they appeared at our fundraiser for Dulwich Community Garden in January 2012. Thanks guys! The band has a loyal following around south east London, and anyone who has seen them will know why! They mix up folk music from many cultures from all over Europe and serve it up with a wildness and urgency like there’s no tomorrow. Click here to go to The No Frills Band’s website!